200 Steps to our Private Beach. Lots of room & Central AC! 200 steps from large, private Sea Pines beach. Big house, big yard, an easy stroll to great private beach. Large private backyard with 2 large decks and an outdoor shower. Across from the kitchen is a seating area for socializing. 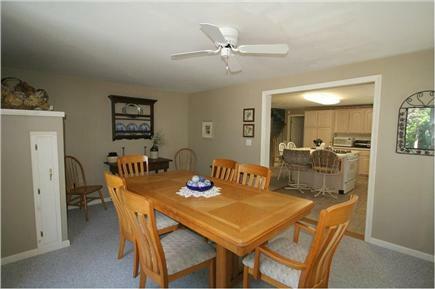 Dining room with walk out to deck, grill and large private yard. A large, spacious kitchen, with lots of room to move around. Large yet cozy living room with plenty of seating to watch TV. First floor MB just off the kitchen with private bathroom. 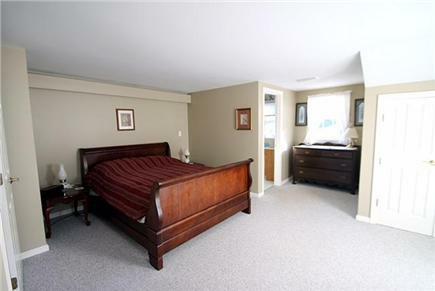 Second floor master bedroom with private bath and access to deck. Upstairs bedroom with twin beds, private bath and TV. Downstairs bedroom with private bath, in quiet area of house. 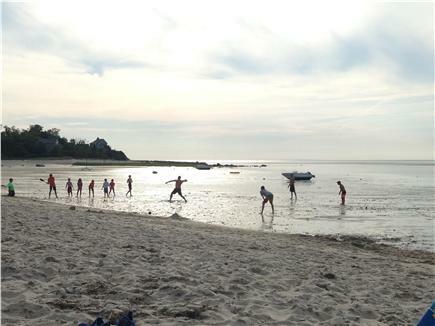 At low tide, walk out a mile or play on one of the sand bars. Make your own memories at the Cape! July and Aug Availability? $500 off listed price. Inquire now. 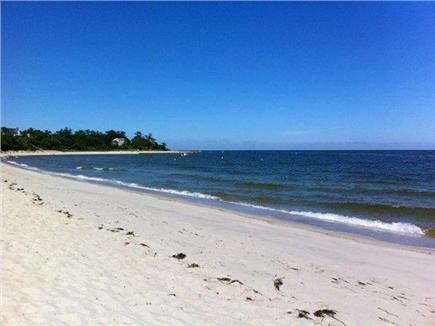 Get away to rest at a quiet and peaceful private beach on Cape Cod. 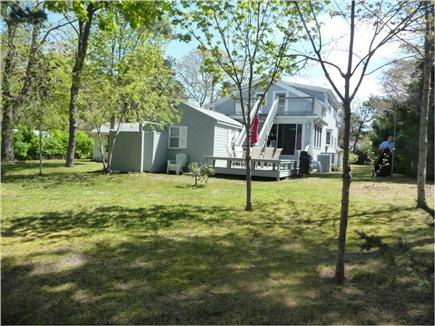 The house is just a stroll down the road from a private beach with access to more than 1000 feet of the bay. Chairs are provided just outside the garage for your comfort on the beach. 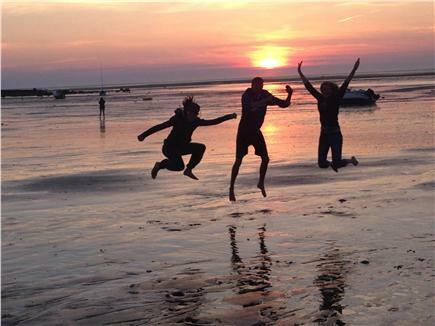 Here you can spend time walking the flats at low tide or swimming, kayaking, fishing or wind surfing during high tide. If you have forgotten something at the house or need to get lunch, no problem. The house is just a hop, skip, and a jump from the beach. Grandfather's Lane is not paved so it has minimal traffic and very quiet. Easy walk to the beach in a quiet mature neighborhood. When you're done at the beach, enjoy a Cape Cod tradition: a warm outdoor shower in the back of the house. Watch the sunset while you walk along the beach, it just seems to go on forever. Our home is 3000 sq. ft. with many places to be together, yet lots of places to be on your own. On the first floor, we have a large, fully- equipped kitchen where you can make your meals and have plenty of room to socialize at the same time. The dining room is off the centrally located kitchen and has a sliding door onto the deck where there is an outdoor eating area, gas grill and a large, level, private back yard for the kids to run around or to play lawn games. There are lawn chairs in the yard to just sit, relax and enjoy yourself with the sea breeze. The rest of the first floor holds a large living room with a wet bar and TV, a sun room with a full view of the outdoors, a laundry room with washer and dryer, and the 4th bathroom. Off the kitchen is a spacious master bedroom with a queen-size bed and private bath. 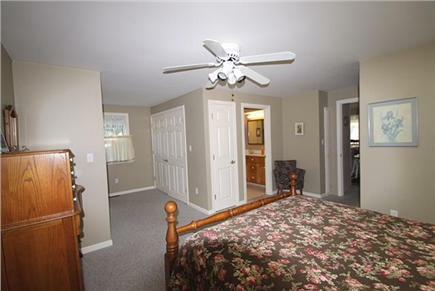 Down the hall from the living room, there is a secluded bedroom with 2 twin beds and a private bath. Upstairs there are two bedrooms. 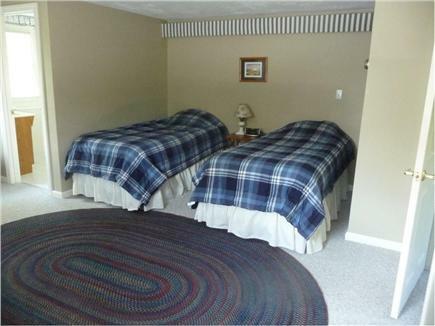 One has 2 twin beds, TV, and a private bath. The other is another spacious master bedroom with a queen-size bed, crib, and private bath, and it exits out onto an upper level deck that looks over the lower deck and private back yard. That makes four bedrooms, each with its own private bath, perfect for a multi-generational family vacation. Off the bedrooms upstairs are 2 large areas, one with a large desk, if you have to do some work, and the other is a quiet sitting area to read or just relax. We have central air and WiFi to check on what you will be doing the next day, or to make reservations. The house's location is conveniently located to many services. We are very close to an entrance to the Cape Cod Bike Trail, where you can bike for 29 miles from So Dennis to Wellfleet, or down to Chatham on flat terrain. You can walk or bike just a short way to 6A and find an ice cream store, liquor store, pizza bakery, restaurant, book store, a Cumberland Farms convenience store, and gas station. Just 10 minutes into Orleans are major shopping stores and a bowling alley. Look in the section at the bottom of this page ''About Lauren Danner'' for more things to do at the Cape. Additional pricing info: $100 discount for rentals of 2 or more weeks. State and local taxes of 14.45% will apply. Had an absolutely fantastic stay!! We LOVED our stay!! 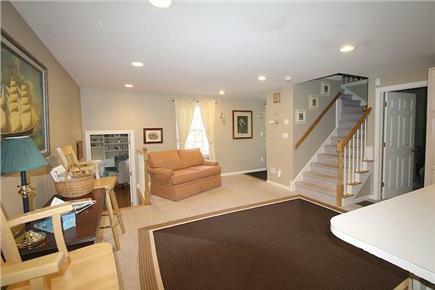 First, let me say that *everything* in this house is much more spacious than it appears to be based on the pictures. So while we were already expecting a very nice house, we were so pleasantly surprised when the place exceeded our expectations! Everything was very clean, and the layout cannot be beat for two families sharing a place, which was the case for us. One family took the upstairs bedrooms (master plus kids bed) and the other (the more noisy one...) took the downstairs bedrooms (master plus kids bedroom). AND, private baths all around!! Parents AND kids! A very relaxing, quiet environment! Just a few steps to the private beach to view beautiful sunsets. A highlight was to walk Brewster flats during low tide. House was very functional and clean. 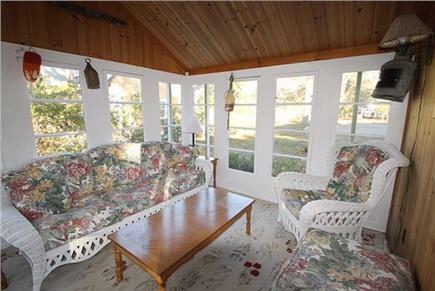 Living room and outside deck were a great place to relax. 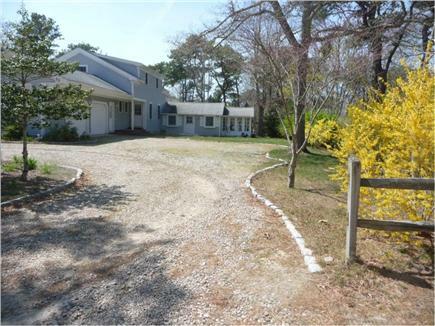 Very convenient to popular restaurants, coffee shop and major Cape Cod bike trail. Cape Cod National Park sites were also nearby. Highly recommend this vacation rental to any family! We loved it! My family and I had our most memorable Cape trip yet! The home was beautiful, spacious, and comfortable. It was amazing to have a 2 minute walk and be on the best beach on the Cape. I also enjoyed the convenience of being able walk into town. I will be back again! Our family spent a week here and loved it. There is plenty of room for an extended family. The house was clean and well stocked and just a short walk to a beautiful beach. The owner is personable and was attentive to all of our needs. We are repeat renters and wouldn't stay anywhere else. With 4 bedrooms, 5 baths, outside shower, large kitchen and spacious family room, this house has everything. The backyard and deck make for great outside dining and entertainment. To top it off, a short walk to the best beach on the Cape. 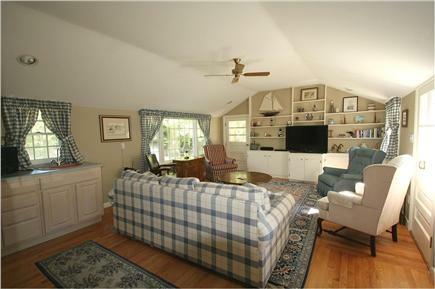 It is in a central location on the Lower Cape and close to many restaurants both casual and fine dining. Thank you for letting us share in this wonderful property. We enjoyed renting this property. It has 4 bedrooms and plenty of space for families to enjoy either time together or time alone. 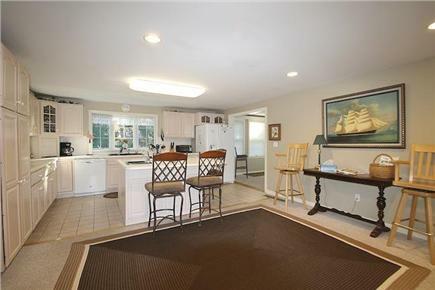 It has an open kitchen with an island, which makes it great for preparing meals, and a nice back deck and backyard. A short walk down a dirt road leads to the path to the beach. The beach doesn't get very crowded. We especially like watching the change in the tides on the Brewster Flats. I have been going to Cape Cod for 55 years, ever since I was a young girl. In the beginning, our family stayed on the Cape for the whole summer. We always stayed in the Sea Pines/Brewster area and I loved it. When my husband and I were looking for a place to retire, we knew that this was where we wanted to be in. After renting for seven years, we have had many good experiences with the people to whom we have rented, and we love to see others enjoying our house as much as we do. We love to hear about any fun things that our renters have done, and what part of the house is their favorite. We can't imagine any place nicer and hope that all of our renters feel the same way. One of the best things about our house is how close it is to a private, spacious beach. I think Sea Pines Association beach has got to be one of the nicest beaches on the Cape. It offers lots of room to spread out and a sharp landscape changes with the changing of the tides. The low tides go out at least a mile, which enables you to check out the wonders of the bottom of the bay, and when the high tides come in on the sun-baked flats, late in the afternoon, the bay water often feels like bath water-- it's so warm. If you've forgotten something at home, or want to get lunch, it's just a hop, skip and a jump to get it. No worries about getting a parking space near the beach, the beach is practically in your backyard. When you come back, you can rinse off in the outdoor shower and then relax in the backyard. The house offers lots of spaces for privacy (with each bedroom having their own bathroom) but also offers lots of common area to be together. There is a large private backyard to play in with tall trees on all 3 sides that makes you feel that you are the only ones there. You can sit on either of the 2 large decks to catch the sea breezes and smell salt water. On the right day you can hear the ocean waves from the house. It's in a very quiet part of town but close to almost anything you would want to see or do. I can't think of a better place to be. Brewster is a quiet, yet quaint town. No busy shopping centers, but still has many attractions. Our house is near the Cape Bike Trails where you can bike all the way to Truro or down to Chatham on fairly level pavement. It offers many sights like Stony Brook Grist Mill & Museum, Crosby Mansion, Harris-Black House and Higgins Farm Windmill, Brewster's Ladies Library (yes, men are allowed), Brewster General Store, Elijah Cobbs House, or walk the historical sights from Widow's War. If you want some exercise, Brewster has lots of trails for walking, swimming at Nickerson State Park, golf courses, mini golf and horseback riding. There are plenty of gift and specialty shops, churches, breakfast diners, fish houses and a theater. A special treat is the Cape Cod Baseball League. The top collegiate players in the country are invited to participate in this 10 team summer league. Games are free and a great, fun, family evening. Cape Cod league alumni can be found on every MLB roster. If you need bigger stores, we are only 10 minutes from Orleans where you will find many larger stores and restaurants. Since Brewster is centrally located on the Cape, you can get almost anywhere in 30 minutes or less. If you send for a Cape Cod Travel Guide from the Chamber of Commerce, CapeCodChamber.org, it will tell you all the goings on here at Cape Cod. Brewster is great because it gives you a quiet place to relax, yet it is close enough to any spot on the Cape that you might want to visit.